If you’re about to purchase a new grease trap you need to consider more than just the initial cost of the unit. Like any piece of industrial equipment, grease traps have costs that go far beyond the initial capital cost. In fact, over a period of many years, capital costs are likely to make up just a small percentage of the total cost of ownership for a grease interceptor. Initial purchase costs will depend on several factors, including how large a unit you need, whether you need multiple units and the type you choose. Traditional concrete grease traps, which have been in use for more than century, are relatively inexpensive and have a large capacity. Newer grease interceptor technology (including our Big Dipper and Trapzilla product lines) may be more expensive initially. However, as with most things in life, you get what you pay for. Grease traps have to be properly cleaned out on a regular basis. If they’re not, they eventually fail and can cause expensive problems, such as messy back ups of fats, oils and grease in the kitchen. Commercial kitchen operators can have their staff clean out the grease traps and dispose of the waste in the trash, or they can hire a pumping truck to pump it out and take it to a landfill. Cleaning out the grease trap regularly should reduce other maintenance and repair costs. -Some types of grease traps (especially larger units and buried units) can only be cleaned out with a pump truck. -Some in-kitchen units (such as our Big Dipper) are relatively easy for staff to clean, while others are more challenging due to the large amount of grease they accumulate. -If you choose to handle grease trap maintenance with your own staff, proper supervision is critical. If the grease trap is not cleaned out regularly, serious problems can occur. If you need help estimating cleaning and maintenance costs for a potential grease trap purchase, please contact us. Finally, it is important to consider the cost of grease trap failure. Though grease interceptors that are properly maintained and regularly cleaned out should not fail, some grease trap designs have inherently lower lives and higher failure rates. Concrete grease traps are notorious for corroding over time due to their inherent design and then failing after a few years. 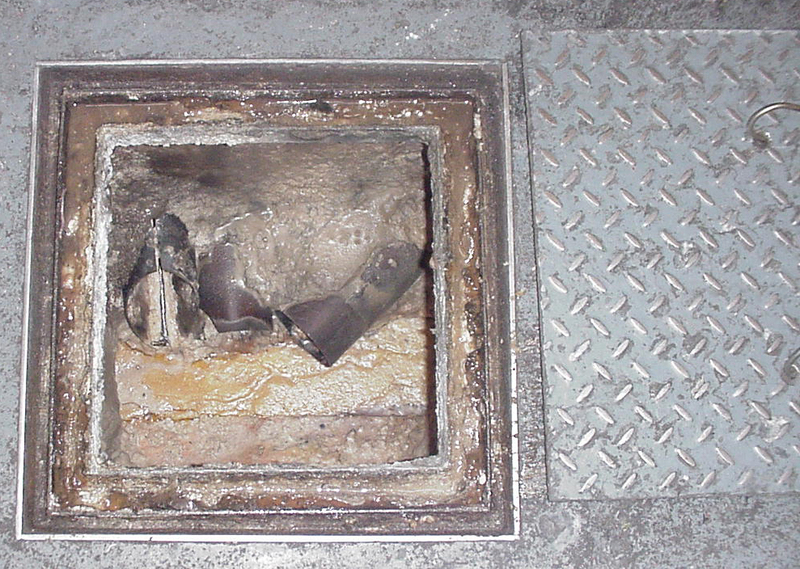 Grease trap failures, whatever their cause, can be very costly. If grease is discharged into the sewer lines, expensive fines can be incurred — thousands of dollars a day in some places. If failure causes a back up into your facility, you could also face health department penalties, nauseating odors from the kitchen and the possibility of having to shut down until you have fixed the problem. If the failure occurs at inconvenient time – such as over a holiday or on a weekend – you may face rush charges or overtime costs in addition to normal plumbing installation costs. Because grease trap maintenance and grease trap failure can be so costly, it makes sense to carefully consider your options before you choose a grease trap solution. Choosing a grease interceptor based on its initial purchase cost can be shortsighted and end up costing you much more — in dollars, hassle and public relations problems — in the long run. Carefully considering all factors is critical.